If there was one thing the weather of January did not possess, it was a consistent identity. Though one might say that conditions during the first month of 2019 were consistently inconsistent, oftentimes with rapid transitions. Yet when all was said and done, conditions did not average too much from the long term norm. Statewide, the average temperature of 31.9° was just 1.2° above the 1981–2010 mean and ranks as the 35th mildest since 1895. This included two days where the thermometer topped 60° in a few locations and four days with some places falling below zero. Rain and melted snow totaled 4.39” on average, which was 0.99” above average. This ranks as the 28th wettest January on record. Four events brought more than an inch of liquid to some locations, yet there was a two-week stretch without such an abundant total. Snowfall averaged 3.8”, which is 3.4” below normal and ranked as the 44th least snowy January dating back to 1895. There was one somewhat notable snow event in the south and two in the northwest, though there were no “blockbuster” winter storms. Central and northeastern areas were almost shut out for the month in the snow department, and for that matter, mostly devoid of snow since the unseasonable event of November 15. For instance, Newark (Essex County) received just 0.9” and New Brunswick (Middlesex) 0.8”, the least in January for each station since 2008. For the month, snowfall over the north division averaged 5.8” (-3.5”), central 1.8” (-6.1”), and south 3.8” (-2.0”). For the season thus far, NJ has averaged 8.9” (-3.9”), the north division 13.7” (-3.5”), central 6.6” (-7.7”), and south 7.5” (-2.5”). 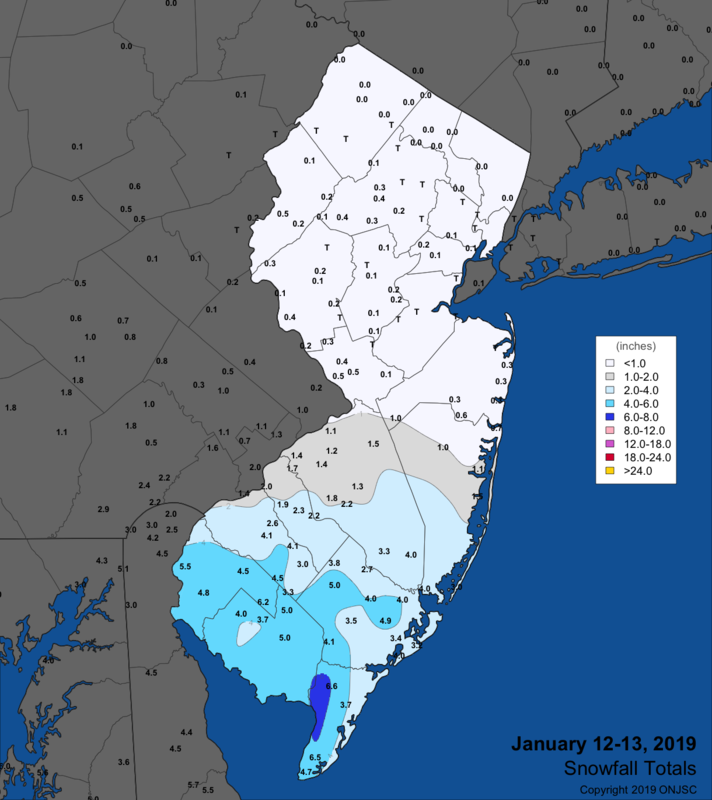 Individual station precipitation totals varied by a factor of two across NJ in January, with the northwest seeing the most and far south the least rain and melted equivalent of snow. Bethlehem Township (Hunterdon) was tops at 7.34”, followed by 7.07” and 7.00” at two Newton (Sussex) stations, Andover (Sussex) 6.93”, Blairstown (Warren) 6.86” and 6.73”, and Union Township (Hunterdon) 6.80”. The lowest totals included Wildwood Crest (Cape May) at 3.26”, Woodbine (Cape May) 3.65”, Middle Township (Cape May) 3.87”, Franklin Township (Gloucester) 3.96”, and Galloway Township (Atlantic) 4.00”. All of these totals and the statewide value listed earlier include rain that fell after CoCoRaHS and most NWS Coop morning observing times on December 31st into the early hours of January 1st. This event is discussed in the December 2018 report. January snowfall totaled 11.4” at Montague (Sussex), followed by Branchville (Sussex) 11.0”, Frankford (Sussex) 9.8”, Bethlehem Township 9.6”, and two Blairstown stations with 9.5” and 8.7”. Less than an inch fell at some central Jersey locations. Rain invaded New Jersey late on the 4th, lasting into the afternoon of the 5th. Andover saw the most at 1.65”, with Branchville coming in with 1.54”, Sussex (Sussex) 1.49”, with 36 locations receiving 1.00” to 1.46” and 103 from 0.50” to 0.99”. Of the 218 CoCoRaHS reports, Dennis Township (Cape May) had the least with 0.04”. A modest line of rain crossed the state from late in the evening on the 8th into the early morning of the 9th. It was accompanied by lightning and thunder in Mercer County. Mercer rain amounted to as much as 0.37” in Ewing, 0.33” and 0.29” in Hopewell Township, and 0.30” at Lawrence Township. Wantage (Sussex) saw 0.30”. The first snow event of the month impacted southern counties during the first half of the 13th, leaving the north untouched (Figure 1). Seven counties had reports of 2.0” or greater, with county maximums of 5.0” at Folsom (Atlantic), Bass River Township (Burlington) 4.0”, Berlin (Camden) 2.5”, Millville and Vineland (Cumberland) 5.0”, Franklin Township (Gloucester) 4.5”, Mystic Island (Ocean) 4.0”, and Pittsgrove (Salem) 6.2”. The water equivalent of the snow was as much as 0.64” in Pennsville (Salem) and 0.41” at Galloway Township. Figure 1. Snowfall totals on January 12th-13th. The evening of the 19th until midday on the 20th brought a potpourri of precipitation types to NJ. It was a pure rain event in the south, with snow and sleet quickly turned to rain in central areas, and in the north there was a slower transition from snow to sleet to freezing rain (and in lower elevations, plain rain). Higher elevations in the northwest never went above freezing, thus travel was worst in this region. Rain and melted frozen precipitation was as plentiful as 2.09” in Bedminster (Somerset), North Brunswick (Middlesex) 1.94”, Red Bank (Monmouth) 2.00”, and Bridgewater (Somerset) 1.92”. 89 stations reported 1.50”–1.88” and 92 from 1.00”–1.49”. Of the 214 reports, Egg Harbor City (Atlantic) and Toms River (Ocean) had the least with 0.63” and 0.64”, respectively. Before dawn, thunderstorms accompanied the rain in Atlantic and Ocean counties. Meanwhile, snow and sleet accumulated to 2.0” or more in six counties, with maximums of 2.3” in Franklin Lakes (Bergen), Holland Township (Hunterdon) 3.0”, Green Pond (Morris) 3.5”, West Milford (Passaic) 3.3”, Montague 5.2”, and Blairstown 3.5” (Figure 2). Figure 2. Snowfall totals on January 19th-20th. The wettest storm of the month occurred from early on the 24th into the late afternoon that day. It brought localized flooding, especially in the northwest where the rain was heaviest and was accompanied by melting snow, with all flowing over frozen ground into streams and rivers. Randolph Township (Morris) received 2.68”, Jefferson Township (Morris) 2.57”, Mine Hill (Morris) and Bethlehem Township 2.53”, and Rockaway (Morris) 2.51”. 26 CoCoRaHS stations caught from 2.00”–2.43”, 49 from 1.50”–1.99”, and 101 from 1.00”–1.49”. Bridgeton (Cumberland) saw the least, with 0.76”. A modest event during the afternoon and evening of the 29th brought plowable snow to the northwest and rain that briefly ended as snow elsewhere. The most rain or melted snow was measured in in both Oakland (Bergen) and Bethlehem Township, each with 0.46”, followed by Vernon Township (Sussex) with 0.45”. Snowfall exceeded 2.0” at locations in five counties, including 5.9” at Bethlehem Township, Washington Township (Morris) 4.3”, West Milford 2.9”, Branchville and Frankford each with 5.0”, and Blairstown 4.8” (Figure 3). Figure 3. Snowfall totals on January 29th. While not amounting to much in the snowfall department, one of the more memorable weather events of the month across most of the state (except the far south) was a snow squall that traveled eastward across NJ from about 2–4 PM on the 30th. This brought with it gusty winds, temperatures falling 10° in minutes, and whiteout conditions lasting upwards of 5 to 10 minutes in falling and blowing snow. This indeed was an impressive invasion of the tropospheric polar vortex into the state. Due to the brief nature of the event, there was not a report of as much as an inch of snowfall. Winds gusted to 50 mph at Moorestown (Burlington), Seaside Heights (Ocean), Fortescue (Cumberland), and Lower Alloways Creek Township (Salem), with 19 other NJWxNet stations peaking between 40–47 mph. In addition to the winds of the 30th, there were ten other January days when gusts at one or more NJWxNet station exceeded 40 mph. The 1st saw gusts of 43 mph in Sea Girt, with five other stations at 40 mph. On the 8th, Woodbine (Cape May) reached 47 mph, Vineland (Cumberland) 42 mph, and Harvey Cedars (Ocean) 41 mph. The 9th found gusts of 49 mph at Harvey Cedars, Mullica (Atlantic) 46 mph, Lower Alloways Creek Township (LACT) 45 mph, and six stations from 40–42 mph. Continuing this windy spell, the 10th saw a gust to 50 mph at LACT, 48 mph in Seaside Heights, and 11 stations from 40–42 mph. High Point Monument peaked at 43 mph on the 11th. Winds calmed until the 20th, when LACT peaked at 50 mph, followed by Seaside Heights at 48 mph, Harvey Cedars 47 mph, Fortescue 46 mph, and twelve other NJWxNet stations gusted to 40–45 mph. Fortescue had a statewide monthly high gust of 56 mph on the 21st, with Seaside Heights 52 mph, LACT 50 mph, and 16 stations from 40–47 mph. It should be noted that on the 20th–21st the High Point Monument (Sussex) station failed to report due to freezing rain encasing the anemometer. No doubt, winds gusted over 40 mph at this location. Berkeley Township peaked at 45 mph on the 23rd and LACT and Woodbine each hit 49 mph on the 24th, with 8 other stations from 40–45 mph. The month ended with the aforementioned gusts on the 30th and Oceanport (Monmouth) up to 42 mph on the 31st. The lowest barometric pressure readings across NJ in January were in the 29.20”–29.25” range on the 20th. Pressure rose rapidly shortly afterward, reaching a monthly maximum of 30.65”–30.75” on the 22nd. Maximum temperatures equaled or exceeded 55° at one or more of the 64 NJWxNet stations on six days during January. The 1st was the warmest day of the month, with the 65° mark reached at Atlantic City Marina (Atlantic), Cape May Court House (Cape May), Egg Harbor Township (Atlantic), Oceanport, and Sea Girt. 40 other NJWxNet stations topped off at 60°–64°, with High Point Monument coolest at 49°. The 6th brought a 55° maximum to Mansfield (Burlington), with Woodbine up to 55° on the 8th. Warmth returned on the 20th, with Mannington (Salem), Mullica, and Vineland all reaching 57°. In the far north, High Point Monument could only muster a high of 30° that day. Five stations made it to 57° on the 23rd. Warmth encompassed the entire state on the 24th, with five locations reaching 61°, along with 10 sites at 60°. Fortescue was coolest at 49°. Minimum temperatures dipped below 10° somewhere in NJ on ten January days. The first such occasions were on the 11th and 12th, when on both days High Point Monument reached 8°. The 14th found Sandyston (Sussex) down to 5° and Walpack (Sussex) and High Point (Sussex) at 6°. Mannington and Walpack fell to 8° on the 15th, with three stations at 9°. The first of two brutally cold episodes towards months end arrived on the 20th, with High Point Monument falling to 0°, High Point 1°, and seven stations between 5°–9°. Wind chill values were below zero statewide, and continued to be so on the 21st, when minimum temperatures were -9° at High Point Monument, High Point -7°, Sandyston -5°, Charlotteburg (Passaic) -3°, Parsippany (Morris) -2°, three stations at -1°, and 50 sites from 1° to 10°. West Cape May (Cape May) was “mildest” at 13°. Daytime maximums on the 21st only made it to 2° at the Monument, 4° at High Point, and 8° in Charlotteburg. West Cape May and LACT made it up to 21°. Walpack fell to -4° on the 22nd, with High Point Monument 2°, and High Point and Sandyston each 3°. 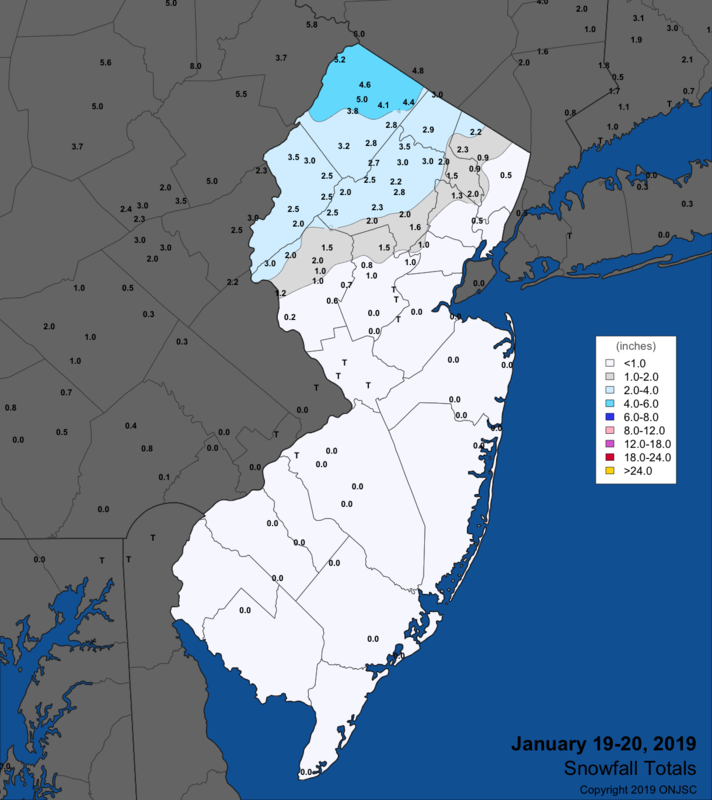 The final blast of frigid air invaded New Jersey on the 30th, with Walpack falling to -8°, and Sandyston, High Point Monument, and High Point all down to -7°. Six NJWxNet stations were between -2° and 0°, with all other sites between 1°and 9°, except Cape May Court House and Atlantic City Marina at 10° and West Cape May 12°. The 31st was one of the coldest NJ days over the past several decades. The -25° minimum reported at Walpack, if confirmed, is the coldest temperature recorded in the state since January 19, 1994, when several unofficial, yet reliable stations in Sussex County valleys fell to that level and even as low as -32°. The instrument at Walpack is being evaluated, while the new station in Sandyston fell to -17°, confirming that northwest valleys were exceptionally cold. Even the highest locations in the area were impressively cold, with both High Point Monument and High Point down to -10°. Pequest (Warren) fell to -9°, with 12 NJWxNet stations at -5° to 0°. Every other NJWxNet station dipped to 1° to 9°, except West Cape May at 10°. Maximum temperatures on the 31st only made it to 8° at the Monument, with Pittstown (Hunterdon) and High Point each at 11°. Atlantic City Marina was mildest at 22°.